this is for the cover of the washington post sunday arts section. it turns out that this is the only story on the front page so they are going to end up running it the size of the whole front page. can't wait to see what it looks like this sunday. its for an article about celebrity interviews and how they are not all spontaneous and are planned out by others behind the scenes. 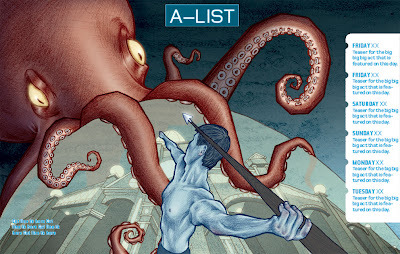 this is a half page illustration for the City Pages (Twin Cities) A-List. Its a calendar of weekly events. 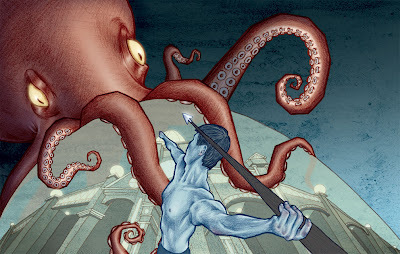 This week the featured event is an acrobatic show with an Atlantis theme. A pretty cool assignment and the deadline was over a week long instead of 2 days or overnight so I was able to spend some extra time on this one. The headline and sidebar will look something like this. Now that I look at it I forgot to put light reflection ripples, even though it might take me a while to figure out how to pull that kind of magic. I have been sitting on these drawings for over 6 months and finally got around to finishing them. The late rappers 2Pac and Biggie. 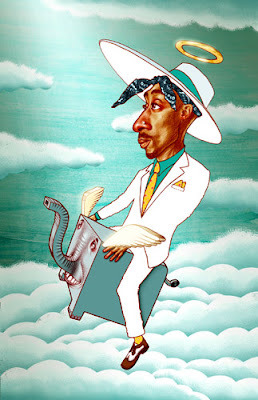 Maybe cheesy but the title of the 2Pac piece is "Tupacaderm". I felt pressed to finally finish these because I have a meeting at Atlantic records tommorow and needed some more music related pieces for my portfolio. 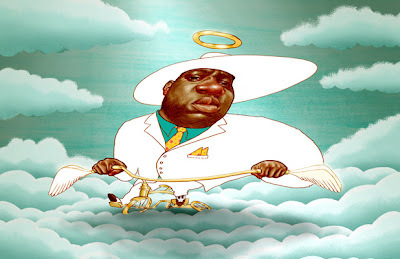 I guess a lot of times when I illustrate rappers I try to delaflate the "gangsterness" quality in them, flipping how you think of them. and since i've been getting so many calls from hip hop magazines lately i've had a bunch of chances to do that. this is a full page illustration for an article about jazz cameos in films. 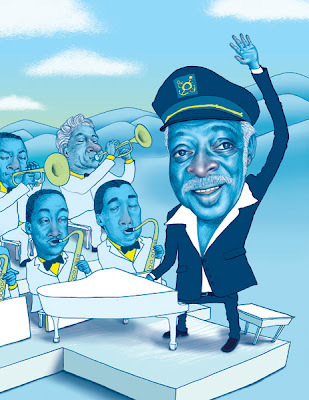 They wanted an illustration of the scene in Mel Brook's "Blazing Saddles" where count basie is with his orchestra in the middle of the desert playing "april in paris" while the new Sherriff in town rides by and gets a salutation from the count. 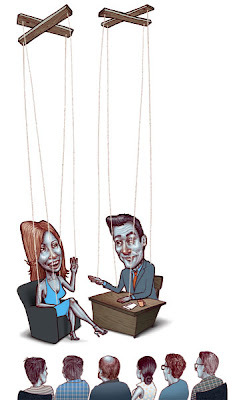 this was for an article about how what rappers say and claim is taken as truth in our culture. 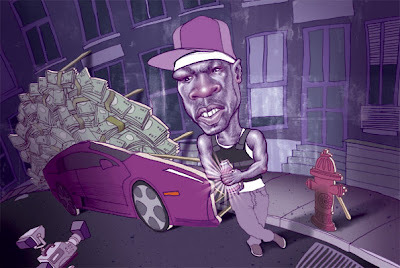 rappers saying their chain is worth a million or they have 10 cars, it's hard for all of this to be verified. Nothing is as it seems and everything is for show. One thing the article touches on is 50 cent's profit from the sale of vitamin water to coca cola. They claim he made $400 million from the deal because he owned 10% of the company but no one can verify any of this, but it's truth on the street now. I didnt know if i should leave the arrows in or out so i dont know which one they chose.